Marble is a luxurious yet delicate stone that is often used in home construction. It comes in a wide range of colors and is sourced from around the globe. Whether you have marble floors, tabletops, or counters, it is important to familiarize yourself with safe and effective cleaning protocols. The right cleaner and technique can keep your marble accents looking shiny and clean. Not only that, but they can help you avoid scratching or even cracking this fragile mineral. What do you need to keep marble surfaces clean and shiny? Marble is an extremely versatile material. While we often associate it with kitchen and bathroom countertops, it can be found in nearly any room of the house. Thin cuts of smooth marble are often used as a decorative kitchen and even fireplace backslashes. It is also used as flooring, especially in entryways. Not to mention, it is often used in architectural elements like pillars, mantels, benches, and basins. While many think of marble as a durable natural material, it is important to remember that it is actually rather soft and porous for a stone. It’s important to properly prepare for marble maintenance, as the slightest mistake could permanently damage it. There are a few supplies you will need to properly clean, shine, and preserve the look of marble surfaces in your home. These include soft cloths, non-abrasive sponges, water, chamois cloths, ammonia, hydrogen peroxide, and/or stone polish. It’s important to thoroughly prepare the surface of your marble before you begin the polishing process. To do so, remove any dust, debris, and stuck-on grit that has accumulated on the surface of the stone. Be sure to pay close attention to corners and grooves were debris can easily be trapped. To do this, dampen a soft clean cloth with warm water and a little dish soap. Run the cloth over the surface of the marble, being careful not to apply too much pressure. Remember, marble scratches easily. Use small circular strokes to thoroughly clean an extended counter or floor. If you’re cleaning marble floors, sweep the surface to remove any dust and debris that has accumulated. Be sure to lift and clean under and around doormats, rugs, and furniture. We recommend using a soft dust mop to perform this task. Stay away from vacuums and abrasive brooms that have the potential to scratch marble. Establish a regular mopping schedule based on the amount of traffic on your floors. Start by running a damp mop over the surface of the floors. 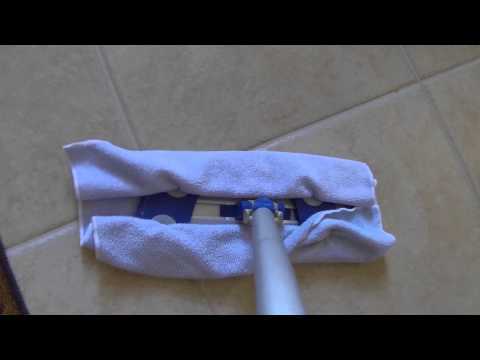 This first step helps eliminate any grime you have missed with the broom. Move the mop in a wide figure-eight motion to ensure even and thorough coverage across the entire floor. Ring out and rise the mop in fresh water. Keep in mind that you may need to change the mop water to avoid mistakenly reapplying dirt. You can also use a pH-neutral marble cleaner to effectively eradicate especially stubborn dirt. While acidic cleaners are not well-suited for marble flooring, a diluted ammonia solution can help remove stuck on dirt and stains. Keep in mind that ammonia has a strong smell and should only be used in well-ventilated areas. Still, it makes an effective floor cleaner when diluted with water. You can even mix it with powdered clay or baking soda to create a homemade poultice for removing stains. Use a clean dry microfiber cloth or chamois to wipe away any remain soap scum and polish the surface of the marble. 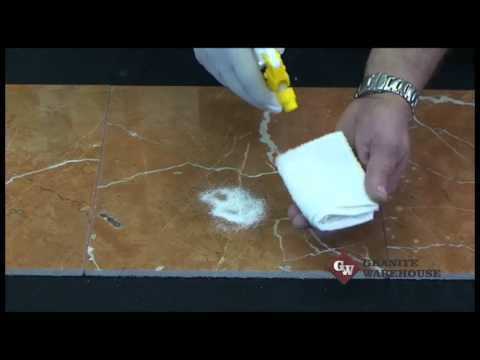 You may also use a store-bought marble/granite polisher to buff the surface of the stone. Alternatively, mix together equal parts water and baking soda to create an inexpensive polishing paste. When applying polish, distribute a thin even layer over the surface of the floor. Allow it to dry for several hours. Then, use a microfiber cloth and a small amount of warm water to wipe away the remaining layer of polish. To ensure the longevity and aesthetic richness of the marble in your home, you should clean the stone daily with soapy water and a nonabrasive cloth or sponge. You should also take care to wipe away spills quickly, as many liquids can leave permanent stains in the porous surface. What’s more, keep acidic foods, like vinegar, tomatoes, and citrus fruits, away from the marble. Acidic substances will quickly and permanently etch the surface of marble. To protect floors from damage, invest in a few area rugs for high traffic areas. When accidents do occur, remedy them as quickly as possible and apply leave-on poultice that is appropriate for the stain. It’s fine to use soap and water on marble floors. Nevertheless, you should only use mild diluted dish soap. If you use too much soap, you’re going to leave behind unsightly streaks and film. The following cleaners and sealers are specially formulated to clean and preserve stone floors and counters. GRANITE PLUS! 2 in 1 Cleaner & Sealer Granite, Marble, Travertine, Limestone Check price! Black Diamond Marble & Tile Floor Cleaner Marble, Limestone, Travertine, Granite, Slate, Ceramic & Porcelain tile Check price! TriNova Granite Cleaner and Polish Countertops, Marble, Stone, Bathroom Tile Kitchen, Islands and More Check price! BISSELL CrossWave Floor and Carpet Cleaner Tile and Marble Check price! Stone & Tile Intensive Cleaner Marble, Limestone, Travertine, Granite, Slate, Ceramic & Porcelain Tile Check price! Granite Poultice (1 Lb) Marble And Granite Care Products Check price! Original ShamWow Clean & polish practically any surface Check price! Kitchen + Home Super Chamois For washing, waxing or buffing and will not leave behind streaks, water spots or lint Check price! TriNova’s Granite Sealer & Protectant Clean Countertop Surface, Marble, Tile Check price! 2 MB Stone Care MB11 Touch-Up For spot polishing of most water stains or rings from polished marble, travertine and any other calcite-based stone Check price! Perox-C Plus Concentrated Hydrogen Peroxide Cleaner Light-colored marbles Check price! Granite Plus! is a pH-neutral marble cleaner with a built-in sealant. You spray it on, let it settle for a minute, and then use a dry nonabrasive cloth to remove it. It is worth noting that you don’t need to rinse the marble after using Granite Plus! For the most part, it leaves granite looking shiny and clean. It’s suitable as a daily cleaner for both marble counters and floors. Black Diamond is an eco-friendly and biodegradable cleaner. It’s a great choice for homeowners with pets and children. Not to mention, the formula is extremely concentrated. You only need 2 to 4 ounces of the Stoneworks formula per gallon of water. Simply apply it using a microfiber cloth and then pat dry for a clean streak-free surface. We even recommend putting the diluted mixture in a spray bottle for easy application. This product is great for marble floors, counters, and other architectural elements. It even doubles as a tile and porcelain cleaner. The TriNova cleaner is a concentrated rinse-free marble cleaner that is both eco-friendly and biodegradable. Like the Stoneworks cleaner, you only need 2 to 4 ounces of TriNova per gallon of water. It is safe and effective on marble, other stone, ceramic, and porcelain surfaces. It deep cleans stones, leaving them shiny and streak-free. For individuals looking for a quicker or more efficient machine clean, we recommend a wet/dry floor cleaner with delicate settings. Ideally, you want something that vacuums up debris and mops floors at the same time. The Bissell CrossWave Floor and Carpet Cleaner has a microfiber mop function that is ideal for fragile marble flooring. It also boasts a spinning brush with ample suction to remove dust and debris lingering on the ground. The smart-touch controls enable users to release cleaning solution as desired. Not to mention, the dual tank system ensures the clean and dirty water never mix. As a result, you are less likely to leave behind grime and soap suds. If a liquid is left on the surface of marble for a long enough period of time, it may leach into the stone’s pores and leave behind an unsightly stain. Many people choose to seal their marble to prevent this from happening. Yet, accidents still happen. Therefore, if you have marble floors or counters in your home, it is a good idea to keep a reliable stain remover on hand. Stone & Tile Intensive Cleaner is an excellent product for deep cleaning marble surfaces. It is a highly concentrated mixture that should be diluted with water before it is applied to a counter or floor. While the company doesn’t list the exact ingredients, we can attest to its stain removing strengths. 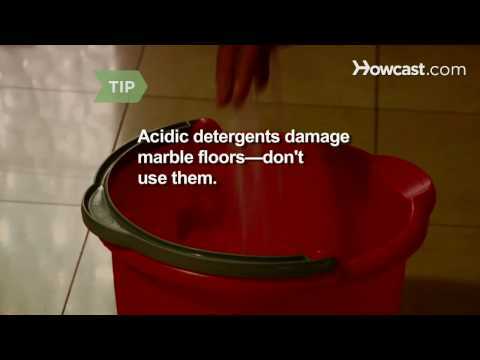 Hydrogen peroxide is yet another safe and effective ingredient for removing stains from marble. It serves as a natural whitener and is ideal for light-colored marbles. We recommend using a concentrated hydrogen peroxide. Allow it to saturate the stain overnight. You can even cover the stain with a layer of plastic wrap to assure it is not disturbed. You can also create a clean paste called poultice. A poultice is a paste-like cleaner that is capable of penetrating the marble’s pours to remove set-in stains. You can make your own marble poultice with just a few household ingredients. To make one you need an active solvent as well as an absorbent white powder. We recommend a simple mixture of water and baking soda. You apply the poultice directly to the site of the stain and leave it for up to 5 hours. Use a sheet of plastic wrap and masking tape to keep the poultice in place. The solvent will penetrate the stain and draw the dyes out and into the powder, which you can effectively sweep away. Granite Poultice is a powder cleaner that is intended to be mixed with a small amount of lacquer thinner. To work effectively, the poultice must be airtight and left for at least 24 hours. It is extremely effective in removing a wide variety of stains on the surface of marble. It’s all too easy to damage marble. In fact, harsh chemicals and rough cleaning tools can permanently etch the surface of the stone. To avoid destroying the patina of your stone, invest in high-quality reusable cleaning tools, such as microfiber cloths and sealers. The Shamwow is an ultra-absorbent orange cleaning cloth. It is machine washable, all-purpose, and non-abrasive. It is made from synthetic materials that are capable of holding lots of liquid. We recommend using a Shamwow to dry or wet wipe the surface of granite. The SuperChamois is another cleaning towel. It is similar to the Shamwow, as it can hold a large amount of liquid. It is also made from synthetic materials and is machine washable. It consists of ai-spun rayon with micropores that are designed to hold liquid spills. It is also ideal for dry wiping surfaces such as marble. People typically seal marble surfaces to protect against aesthetic damage. Sealant helps prevent moisture from penetrating the marble’s pores. It may be applied once a year. TriNova Granite Sealer and Protectant is a concentrated formula that comes in an easy-to-use spray bottle It is made of a blend of polymers and does not contain dangerous chemicals. As such, it can be used on both floors and counters. Overall, it makes surfaces smoother and shinier. Not to mention, it prevents marble from being penetrated by liquids. 2 MB Stone Car Touch-Up is yet another marble polisher. While it does not seal marble, it does help the stone revert back to its original luster. You can apply the 2 MB with a microfiber cloth. I can be used daily. How to remove an acid etch stain from your marble top – MB Stonecare MB 11. Marble doesn’t have to be scary. While it is true that it damages easier than other stones, there are some simple things you can do to ensure the marble in your home is always looking good. For one, always keep baking soda on hand. Baking soda is very inexpensive and can serve as an impromptu poultice. If you spill something on the marble, pick it up immediately. Use a microfiber or cotton cloth to blot it up. Avoid rubbing it in. Then, apply homemade baking soda poultice to extract anything that may seep deep into the marble. If you don’t have baking soda, you can always combine flour and dish soap to create yet another type of homemade poultice. You should also seal your marble counters during and after installation. You don’t need to be an expert craftsman to apply a sealant. Water should bead when it is dropped on a sealed counter. If it doesn’t, it is probably time to reapply sealant. Mop floors daily with a mixture of mild soap and warm water. Clean your floors with mild detergent or stone soap. Make sure these substances are designed with a porous stone in mind. Thoroughly rinse and dry the floor. Soap can accumulate on the surface of marble and leave behind streaks and scum. Always blot up spills soon after they occur. Ink, paint, acidic substances, and other liquids can permanently damage the aesthetic of your marble. Utilize non-slip mats, rugs, and runners to protect high-traffic areas. Acidic. Avoid using vinegar, lemon juice, or other acidic cleaners. These can etch the surface of the marble. Avoid bathroom cleaners, as many contain acidic compounds. Avoid abrasive cleaners such as dry cleansers or soft cleansers. Never mix bleach and ammonia. These chemicals create toxic fumes when mixed together. I can even be lethal. Avoid using vacuum cleaners that are worn or have metal or plastic attachments. These can permanently etch the surface of marble floors. It is important to note that not all stains are alike. In the next section, we’ll hone in on how to treat certain types of stains. Oils tend to leave dark splotches on the surface of marble. Hydrogen peroxide is a great treatment for oil-based stains on light marble. Keep in mind that it has natural whitening abilities, so it’s best to abstain from using this on dark stone. Meanwhile, acetone is great for oil-based stains on dark marble. Both substances work best when they are combined with baking soda to create a homemade poultice. Organic stains are created by things like coffee, tea, foods, urine, and more. They can leave behind distasteful pinkish-brown stains. You can use a mixture of hydrogen peroxide and diluted ammonia to help eradicate these discolorations. Metal stains occur when iron, copper, or bronze come in contact with water and leave behind rust. These stains are brown or even green. You can try using a basic poultice on these stains, but they are extremely difficult to lift out of marble. These stains typically occur outdoors or near houseplants, as they are from algae, lichens, and other green substances. We recommend using a mixture of diluted hydrogen peroxide to eradicate these green monsters. To successfully remove ink stains from marble, you must act fast. First, first the surface with warm soapy water. Then, apply a cloth saturated with rubbing alcohol. Finally, use diluted ammonia to dab away any remaining dye. Wondering how to remove paint stains? Use a small razor blade to carefully scrape off the paint. Keep in mind that you can permanently etch the surface of the stone by applying too much pressure. You may also use lacquer thinner to loosen the paint from the surface but do so with caution. Water stains are fairly common in marble. Use a fine grade steel wool to buff these stains away. We recommend a circular stroke pattern, as this is the most effective way to buff marble. Marble poultice has a magical way of eradicating tough stains. It penetrates deep within the marble’s pours to draw out discolorations. We will describe to you in detail how to make and apply a marble poultice. Gather the ingredients you need to make a homemade poultice. If you are using a store-bought poultice, you can skip ahead to step four. We recommend making a simple paste that consists of equal parts baking soda and mineral water. Both of these items can be found in most grocery stores and are rather inexpensive. You can substitute the baking soda for another absorbent white material, such as flour. You will also need a ceramic bowl and spatula for mixing, plastic wrap, and masking tape. Mix the mineral water and baking soda together till you get a dough-like consistency. Remember, the mineral water will draw out the stain and the baking soda will absorb it. If you don’t have baking soda, you can use paper towels, talc, cotton balls, or another white absorbent material. You may choose to use a liquid solvent, depending on the type of stain you’re removing. Commonly used liquid solvents are ammonia, acetone, and hydrogen peroxide. Refer to the information above when identifying and treating specific stains. Apply the poultice directly to the stain. Make sure to apply a thick layer and cover the entire surface of the stain. You may wish to test your poultice in an inconspicuous area before treating a noticeable spot. Cover the poultice with clear plastic wrap. Use masking tape to secure the entire perimeter of the plastic wrap to the floor. It works best if you create an airtight space for the poultice to work its magic. Wait. Try not to be impatient. The poultice needs to sit for at least 24 hours to work its magic. Avoid disturbing the poultice. After 24 hours have passed, you can remove the poultice. Then, wash the surface of the marble with warm water. If the stain is gone, the poultice has done its job. If the stain is lighter, apply a second poultice as directed above. Repeat the process until the stain is no longer noticeable. Despite the rumors, marble is a highly durable and desirable stone to have in your home. While its porous nature requires a bit of extra attention, it’s certainly nothing to fret over. If stains happen, react quickly. Clean your floors and counters regularly to avoid missing a treatable mistake. Stock up on marble-safe clothes, buffers, and poultices. Or else, refer to the aforementioned ingredients to make a stain remover of your own. We assure you that the minimal maintenance is well worth it! My grandmother has had some problems with her floors in her new flat. Thanks cozyhousetoday! I’m sure I’ll show her. I know one more way to make your floor clean! Just throw some water with some vinegar on the floor and mop it! It is much easier. But you also offered cool ideas! Hi there! It is important that the cleaning solution used on the marble floor be pH neutral. This means no vinegar! Do not use acidic cleaners on your marble. It’s better to use salt instead. It will lose shine and scratch or else. Acidic detergents on these surfaces will dull and destroy them. Sure, we have such a thing. So, you need mild liquid detergent, 2 buckets warm water, large sponge and soft, dry towels. Dilute a tiny amount of the mild cleaning detergent into one of the buckets of water. Soak the sponge and wring it out until it’s merely damp. In steady, arching motions, sponge the floor. Do not forget to rinse the cleaned area with warm water from the other bucket. Dry the surface with dry and soft towels immediately. That is it. Good afternoon! In your case you’d better not scratch you floor roughly, just scrub it vigorously with a soft-bristled brush. Do not forget to wipe up spills immediately to protect the marble. We wish you luck! Thank you for very informative and detailed review. What about citrus fruits or baking soda for washing the floor? Will it damage the marble or not? Looking at citrus fruit juice it seems to us that is acid. So this liquid is going to corrode the material. Baking soda is appropriate for these purposes, we recommend you to use microfiber cloth to clean your marble surface safely. Another important thing to know is never let marble air dry so make sure you have extra clothes in handy to wipe dry your marble. How can I cut through grime? I know that I must be sure to stay away from bleach and other harsh chemicals. May I try peroxide or vinegar? Thank you beforehand. Hello! Peroxide and vinegar are also harsh chemicals that you should avoid using. Furthermore, use a ph-neutral soap diluted in hot water. Hot water will help you to get rid of grime. Hot water will decrease the chance you will need tougher solvents. These solvents could damage the marble. Distilled water? What does it mean? Where can I get it? Distilled water is type of water which is physically clear. It means that it has gone through the process where impurities and minerals were removed. It is usually cheap and you can buy it at any pharmacy, supermarket or local stores. Why do I need mop the floor again with clean water? It is already rather clean. Twice! It needs much water and patience. I can’t see any debris on it. so why? That’s a nice question! After you have mopped the floor so that it doesn’t have any chemicals on that. You should mop it again with cool clean water to remove any suds and pick up any debris that remains on the floor. Even if you cannot see them, it doesn’t mean there are none of them. It is worth it. I’ve spilled some coke or coffee (something black, I don’t remember what it was) on the marble floor in my kitchen. I didn’t intend to let it air dry, but I forgot to mop it off right away. I am afraid this could discolor the marble L What can I use to polish it up? Oh, that is a bad piece of news. The worst thing you could do, you’ve done. You allowed the liquid to soak into the marble. It can really stain the marble. Of course, clean up your marble floor immediately after you noticed it. Use a wet microfiber cloth for it. To polish dull area you can use a marble polishing powder. Hope it will help. Good luck! I usually use my vacuum cleaner to remove debris from the floor. Or I just sweep the floor with the broom. The broom must be soft and must have soft bristles. Nice tip! Moreover, you have to pay special attention to the places along doors and walls. Using a vacuum cleaner be careful. You may damage the marble floor, if you have plastic on the nozzle which can scratch your floor. My dog and my kid cannot exist together with my marble floor (( Vomit and urine are everywhere… I know it was my fault to buy marble cover…so I still need to ‘fight’ against these disgusting liquids. Anyway you have to clean up your marble floor each time it gets dirty. Dip a soft cloth in warm soapy water and wipe any liquid up with this cloth. Then after cleaning, dry this recently cleaned spot. In case of a stain, you may need to apply a poultice to it. Purchase a poultice which is appropriate for marble at a store for home improvement. After that apply the poultice to the stain –about half an inch thick. Cover the poultice and let it sit for 24 hours. Remove the poultice and again mop the floor. Sometimes I have a white quartz countertop. That has these mysterious black vein-like stains. Will TriNova work to remove them? Thanks. We cannot say for sure. If the veins are deep in the granite, it is not a stain. We would give it a try. But this cleaner is nice for stains but might not be able to help you. You know, many men, many minds. Marble installations may give any interior a touch of glamour and elegance. Yes, marble is much porous, that makes it more prone to staining like it is wearing., unlike granite. It is not hard to keep it in normal condition, you just have to keep some simple rules in mind in order to clean marble. To remove stains on marble surfaces I use only professional detergents. But nowadays it is too expensive for me. Do you have any domestic ‘recipes’ for cleaning this surface? I hope they are cheaper. We know for sure there is baking soda in every home. It is the best cleaning agent to remove stains. Thanks to being mildly abrasive it doesn’t etch the marble surface. But you should use it in the correct way. Even if stains are oily, so you will sanitize and deodorize the surface. Don’t forget using baking soap with Ph-neutral dish soap. Combine 2 parts baking soda with 1 part dish soap. Mix 2 ingredients together. Make a paste adding distilled water. The paste will have the consistency like sour cream. Cover the marble surface with this paste using a wooden spatula and covering it entirely. Let it sit for 12 to 24 hours, this way you allow it to work on the stain. After required time, give the marble gentle scrub with an old toothbrush or if you have large marble surfaces, use a big cleaning brush with soft bristles. Scrub off the cleaning paste. To remove the baking soda and dish soap paste, rinse the marble with distilled water. Dry the surface promptly with a soft towel. I am writing about TriNova Granite Cleaner and Polish for Daily Use. Will this clean the stains on a white Corian sink? It stains easy from coffee and tea, so stains are dark. And another question about granite…Will it clean hard water deposits on granite? Welcome here! Thank you for your question. It is perfect product to clean such stains on your sink. Even if it is white corian, you can certainly use it! As for hard water deposits- we are not sure. But we will not surprise if it works. But remember if it is a deep stain, TriNova will not remove it. A nice piece of info from Trinova, they offer a 100 percent satisfaction guarantee for all products. If not, you will have your money back.